He already said there are a minimum of six magnets on his rotor. He already said the magnets are not in a straight line with the rotor center. He already said the ramp pivots in the middle to be able to change the speed of rotation, in other words adjustable. He already said there are magnets on the ramp like in the Bedini picture I posted but only the repelling magnet is shunted (in other words, iron between it and the rotor. The drawing violates all of these statements and/or is missing parts. We have to start somewhere though. And that is as good a place as any! Last edited by Turion; 09-03-2015 at 04:30 AM. Well, you must have magnetic attraction so where does it come from? It comes from iron ramps between the stator magnets. You have all seen Bedinis picture that shows the 4 magnets on the rotor and a repelling magnet at the end of a curved ramp on the stator. There is the basic concept in all its simplicity. What isn't shown is an opposing ramp with it's attracting magnets for balance. Other than that, the principles are all there including a useful magnetic shunt on the stator magnet. See? It's not even my idea, I just applied symmetry to it. The only tricky part is maintaining the magnetic symmetry at the end of the ramps next to the magnets. Do you have any proof of concept experiment to share for showing how one way net magnetic force is manifesting for the rotor movement which does not have "sticky point" problem? It does not need to be under NDA and can be very different build just preserving same concept. So the builders could try to replicate at least that and see effect for themselves. He already said there are magnets on the ramp like in the Bedini picture I posted but they are not shunted (in other words, no iron between them and the rotor. a complete profile. Glad to see you have got it. I love it. spell this out a little more clearly each time. Any takers on making a drawing based on these facts??? Last edited by BroMikey; 08-27-2015 at 08:20 PM. Sorry I couldn't get back before now. Dave, Turion, seems to have the best grasp of this so far. Chet, the ramps in the concept picture you posted have two problems. They are way too long so the rate of change is very little, which kills the torque. The second problem, which we haven't touched upon yet, is that each ramp in that picture connects two stator magnets. You have to take magnetic induction in the ramps into account. Having a stator magnet touching at each end of the ramp turns the ramp into a bar magnet with strong NS poles, and interferes with things. We want the ramp close to or touching only one magnet at the end of the ramp like the Bedini drawing. Remember that the flux always takes the path of least resistance, so as a rotor magnet passes a stator magnet you need a space before the beginning of the next ramp. The distance of this space varies with magnet strengths but a rule of thumb is a minimum of 1.5 to 2 times the gap between the rotor magnet and the ramp, at its widest point. In my 8 pole motor, with magnets every 45 degrees, the ramp length was about 30 degrees. Yours may be a little different. Magnet shunts. Dave, I believe I said you do not want to shunt the attracting magnets the way the Bedini picture shows. Remember how I said that as a rotor magnet is accelerating towards an attracting magnet, the repelling magnets at the opposite side were neutralizing the pull of the attracting magnet? A shunt on the repelling stator magnet similar to the Bedini drawing will kill some of this neutralization and add to the torque. You only need the neutralizing action of the repelling magnets after they pass their center lines. Any neutralizing affect you can eliminate before that point is beneficial. Likewise reducing back drag attraction on the attracting set, with a shunt on the other side of this magnet from its ramp, can also benefit. I can not provide details on the shape of the shunts or any spacings they may have. Look at the Bedini picture for ideas. Too big of a shunt will make things worse. Guys, the 2 pole rig is not a good motor. Think of it as 2 poles of an 8 pole motor. It's best used to figure out how to balance the forces and develop the ramp design and shunts. Use short ramps like you would have on an 8 pole motor. What you want to shoot for is the most acceleration along the ramp and past the stator poles. It's much easier to see and measure the results with 2 poles. When you have the best results you can get, then add and tune two more poles at a time until it's a complete motor. When the second set of poles are added you may end up tweaking the ramp length to get the optimum spacing. Mario, the rotation of my magnets was not 45 degrees. The exact angle depends on the rake of the ramp so you may want to try between 30 and 45 degrees. One more point tonight. My motors were not complete self starters. They had dead spots. They needed a start just like a gas engine and a small flywheel also helped. T-1000, I did the concept builds more than a year ago and those are long gone. My NDA prohibits making public any images or demonstrations related to the design anyway and I will not risk that. I'm skating on the edge as it is. Remember how I said that as a rotor magnet is accelerating towards an attracting magnet, the repelling magnets at the opposite side were neutralizing the pull of the attracting magnet? A shunt on the repelling stator magnet similar to the Bedini drawing will kill some of this neutralization and add to the torque. Too big of a shunt will make things worse. Guys, the 2 pole rig is not a good motor. Think of it as 2 poles of an 8 pole motor. When the second set of poles are added you may end up tweaking the ramp length to get the optimum spacing. The exact angle depends on the rake of the ramp so you may want to try between 30 and 45 degrees. My NDA prohibits making public any images or demonstrations related to the design anyway and I will not risk that. I'm skating on the edge as it is. everywhere around the web for these terms so I don't lose focus. Ramps, Rakes and shunts, right. you would find on an oil pumping rig for oil wells. diagram was doing your idea justice. will fix it right? Just having a little fun with them. What a world we live in. You are a big help Mack and thanks again. side swiveling instead. "Zero" is pivoting up and down. As a rotor magnet passes a stator magnet you need a space before the beginning of the next ramp. The distance of this space varies with magnet strengths but a rule of thumb is a minimum of 1.5 to 2 times the gap between the rotor magnet and the ramp, at its widest point. In my 8 pole motor, with magnets every 45 degrees, the ramp length was about 30 degrees. Yours may be a little different. A shunt on the repelling stator magnet similar to the Bedini drawing will kill some of this neutralization and add to the torque. You only need the neutralizing action of the repelling magnets after they pass their center lines. Any neutralizing affect you can eliminate before that point is beneficial. Likewise reducing back drag attraction on the attracting set, with a shunt on the other side of this magnet from its ramp, can also benefit. Too big of a shunt will make things worse. Use short ramps like you would have on an 8 pole motor. What you want to shoot for is the most acceleration along the ramp and past the stator poles. It's much easier to see and measure the results with 2 poles. When you have the best results you can get, then add and tune two more poles at a time until it's a complete motor. When the second set of poles are added you may end up tweaking the ramp length to get the optimum spacing. The rotation of my magnets was not 45 degrees. The exact angle depends on the rake of the ramp so you may want to try between 30 and 45 degrees. My drawing is missing the magnets on the ramps and the shunts. I also couldn't figure out how to curve the ramps. I believe the rest of the parts are in place. Angles, sizes, relationships are all the things that need to be figured out. Anyway, here is MY drawing. I am learning to use this program and this drawing took me FAR too long. I don't have that kind of time to spend right now, but someone who is good at this can take a look and draw their own, making the necessary changes. I gave it my best effort guys, and it reflects everything I have learned from what has been given us, EXCEPT those things I have mentioned and the things I quoted here. center of those long arms? Obviously the blocks represent the magnets. Mack did say something pivoted in the center? I am still tapping my toe over here wondering what toggles back and forth. Yes, the ramps, which should be curved (and I showed as just long rectangles) should pivot in the middle so that you can adjust how close the "close" end comes to the magnets. There should also be a magnet on the "close end" and every other one should have a "shunt" on it which partially blocks the magnet on the ramp from the magnet on the rotor. Dave, I believe the stator magnets are rotated also by 30-45 degrees. You may be right. I looked at two stator magnets that are directly across from each other and if I rotate them 45 degrees, it just didn't look right to me. But hopefully we'll get a little more direction as we go. And hopefully someone who is better with a CAD program can take over!!! You're getting there. I really hope you will start with the 2 pole before building anything bigger. Don't overly concern yourself with the shunts until you have at least a 2 pole setup to experiment with. Then you can easily see how placing a shunt on one side or the other affects things. Don't worry about the pivot in the center of the ramps until later. Everyone, I have revealed all the information I am comfortable with. You can verify the concepts yourself with 4 magnets, some transformer iron, an axle, 2 bearings, miscellaneous hardware, some wood, and some effort. The main ingredient is careful attention to detail and keeping in mind how the 2 opposite poles work together. Don't overlook the magnetic induction effects in the ramps caused by the magnets on the stator and rotor. Balance the magnetic forces first, then experiment with ramps, then shunts. BTW when you add the ramps you will likely see the balance gets altered and some adjustments will be needed. If you don't quite understand what I have written about so far, I'm sure it will become more clear as you experiment. Ha, I just looked at the thread at overunity research and I see someone is up to their usual, which should be expected I guess. Everything I have presented here is prior art. What others believe or insinuate about me or my work is of no consequence. Simple drawing of two pole arrangement. I have attached a simple drawing of your suggested two pole arrangement, it is shown without the obviously needed ramps/shunts. Is this where we should start ? Ha, I just looked at the thread at overunity research and I see someone is up to their usual, which should be expected I guess. and people who attack out prize members. see grumage is already on the case. Great work man. The facts you have suggested will take time to assimilate. Last edited by BroMikey; 08-28-2015 at 07:35 PM. Thank you for patiently answering questions and for pointing us in the right direction. You are a gentleman and a scholar. Before you depart, I hope you will chime in on the issue of orientation of the stator magnets. Are they aligned through the center of the rotor as I showed in my drawing or rotated as Grumage depicted? The answer to that will save us considerable time even if the degree of rotation is different. And I will DEFINITELY start with two rotor magnets and stator magnets and get those balanced before I even THINK about adding ramps or more magnets. Hi Mac, I've spent many hours with mag ramps , that's basically what this is right? So you must offset that balance , then offset it again in the opposite direction (or polarity)? I tried spring loaded levers so as the approaching magnet drew the lever towards it , it stretched the spring , but once the magnet hit dead centre, the spring re-coiled and pushed an opposite pole magnet (attached to the other end of the lever) to push away the now exiting magnet. Trying to picture in my mind what your saying ,but all I can see is balance. I hope your right and I'm wrong, but I just can't picture it. Yes, that is essentially the 2 pole arrangement. However, as a baseline to start with I would suggest less angle on the rotor magnets, say 30 degrees or so, and point the center line of the stator magnets straight to the center of the axle like Dave's drawing. To save some time and effort later, when you set up this test rig you should put the stator magnets in a mounting block that can be repositioned as needed. You will want to try different angles and rotor clearances with these. You don't really need a round rotor for this rig you know. A flat board that will accept the two rotor magnets will suffice and it's easier to build and balance. Your choice of course. To be precise, one set of magnets pulling and another set pushing in the opposite direction. Balance is the basis of this, it is the essential starting point. We will not be offsetting in a flip flop manner to achieve rotation. P.S. I have some free time today and I would like to write up some background information for this motor. I'll be back to later post it and I hope all of you will find it interesting. Thanks MadMack for your explanation and desire to disclose all this info. The Ramp building - I believe should be made like this, from less iron mass to more as it increases attraction...I added a magnetic blocking mat to generate a more radical change over time at transition stage...As return spring (not shown on CAD) should be balanced as well to the magnetic forces. Another add to Ramp in this drawing is not to grab-contact iron to both poles (like Bedini's design) but only to South (in this case)...as it entire mass would become "an extension" of that South Pole. I see there is a lot of possible adjustments in order to create the perfect balance for a continuous (perpetual) rotation...I just cited a few on drawing. Mad Mack, I saw your last post as I was uploading this...so I will rectify Stators Center Line to point at Rotor Center...makes sense! Last edited by Ufopolitics; 08-29-2015 at 06:54 PM. Hold that thought. Can you change a few things when we need it done? same. If they are not the same please point out where. The cad picture is a very nicely done diagram. Thanks UFO, for making yourself available, great abilities. I know what a ramp is but what is a rake? Last edited by BroMikey; 08-29-2015 at 07:22 PM. Ufo, nice drawing, but there are big differences from what Madmack described. Read his post nr.36. Nice drawing UFO, but you've got an all-repulsion setup there, which is not what MadMack described. Ah, the drawing, done very quickly in " Paint " so yes there are a few discrepancies but you were able to get the gist of what I was trying to establish. And thanks for the alignment tip's. IMO your design probably makes use of the " Gary Effect " especially in the " Ramp " area. I spent a good two months last winter trying to build a replica. I found out that my scale was just a wee bit too small. Off topic, I know, but here are a couple of videos on that device. It did, however teach me a lot !! This knowledge gained, might just help. Wow, several posts since I left. Regretfully, I don't have time to respond to them right now though. I promised you some background information, so here we go. This applies AFTER you have balanced the forces in the 2 pole to very little or no cogging and you haven't attached any ramps. There is a book written about 170 years ago that you should have. Davis' Manual of Magnetism. You can get a free pdf from Google books, just search Google for the title. There is a section on Induction of Magnetism, it starts around page 61. Read section 1, By the Influence of a Magnet, even though you already know all of this stuff. Sure this is basic magnetism 101, but the basics are jealous and spiteful things and if they are not given their due attention they will happily kill the motor just because they can. Page 66, fig. 44. That is essentially a rotor magnet and an acceleration ramp. The vertical bar magnet is the rotor magnet and the horizontal iron bar is the ramp. See the magnetic poles induced into the ramp by the rotor magnet? There are 3 north poles. Obviously the north poles at both ends of the ramp, which are created by the rotor magnet, will try to keep the north pole rotor magnet from moving past the middle. We can add some rake by angling the ramp but that will only alter the balance point a little and the rotor magnet will still try to remain over the ramp at the balanced point. Result: a non working motor. So we fix this by putting a south pole stator magnet under the left side of the iron bar in fig. 44. If the stator magnet is not over the ramp, the ramp will have a south pole on the left and a north pole on the right. Now there is a strong south pole that will pull a north pole rotor magnet toward it, right to left across the ramp. The closer the rotor magnet gets to the stator magnet the stronger the pull. Right? Yes, but what is going on now at the right end of the ramp? There is a north pole at the end of it right? So that should push against the rotor magnet and help things even more. Right? Well, no. What is happening now is the rotor magnet is inducing a south pole into the ramp at the right end which will try to pull the rotor backwards. We just can't win it seems. Even though the rotor will now pull toward the south stator magnet at the left, that pull is being robbed of its strength by the affects of magnetic induction in the ramp, the induced south pole at the right. The degree of loss drops as distance between the rotor magnet and south pole stator magnet decreases, and distance between the rotor magnet and the south pole at the right end of the ramp increases. So, what could be done to reduce this unwanted loss? The induction can't be done away with. We are restricted to the single rotor and stator magnet for magnetic sources, and we have the ramp itself. No other magnets or mechanical mechanisms are available. The acceleration ramp will eventually have another magnet a little ways past the right end of it and we don't want to get to close to that with the ramp, so what is left to do that will reduce the loss? The answer should be easy if you understand what is going on here. The ramp does not have to be a straight piece of iron. We could add some length to the right end of the ramp and bend this extra length down and away from the rotor. This would place the induced south pole farther away from the rotor magnet and reduce it's affect. That's all for now. I wanted to write more but I'm out of time. The point of this post was to illustrate why you need to dissect the motor into its smallest components, understand what is happening during operation and take every action and reaction into account. It's the small things make the difference. Just so you know, it may be a couple of weeks before I return, life circumstances being what they are. a 238pg book from the 1800's, I am reading the book right now. Last edited by BroMikey; 08-29-2015 at 10:30 PM. The secret of all magnetic mtors are additional freedom of movement. It can be a device wit mechanical switching to eliminate sticky points or a combined usage of gravity and magnetism or the contruction of device with not only one freely moving rotors but two or three. All in all it is the freedom which moves everything.Don't be angry. Downloaded the book, and the imagery helped to understand your post even more. Some more studying with notes. Did build small version(2) pole to test a little and try to understand with hands on class room learning. @ Ufo, thanks for the cad picture. Hope this is first of many from your professional mind. The CAD is incorrect. Its a nice copy of the Bedini diagram, but that's not what we have here. wantomake: Mack's last post is key to understanding the basic principles so go strictly by that. The ramps need to be in a L or V shape with the center of the ramp being the bend point away from the rotor. This way the only part of the ramp that is exposed to the spinning rotor is the North side, the South side bends away. The ramp is a induced magnet in itself. So, while the south side of the "ramp magnet" is touching the ramp, the North side of the ramp is touching the magnet. You make the ramp long enough to bend away the south half of the ramp. We are exposing the rotor to a single pole, induced magnet by bending the other pole away from the rotor. He he! Last edited by tachyoncatcher; 08-31-2015 at 07:18 PM. to help me get this right. is present as the rotor spins. Last edited by BroMikey; 09-01-2015 at 05:59 AM. THESE ARE ALL DIRECT STATEMENTS FROM MadMacexcept the parts in red I added which are to help things make sense in context. These are all the clues he has given us to build this project, so do not let various incorrect (including my own) diagrams send you down the wrong path. Don't take the simple way out and look at pictures. CHECK those pictures against what he wrote. 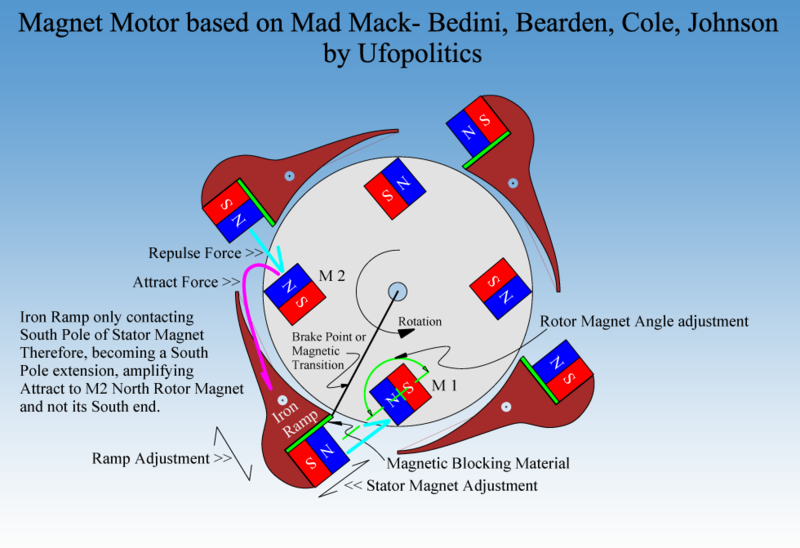 You have all seen Bedinis picture that shows the 4 magnets on the rotor and a repelling magnet at the end of a curved ramp on the stator. There is the basic concept in all its simplicity. What isn't shown is an opposing ramp with it's attracting magnets for balance. Torque can be improved by altering the vector of the magnetic pull. You do this by placing the rotor magnet so its magnetic axis is not through the center line of the rotor shaft. The closer the gap between the rotor and stator magnets the more critical the individual magnet clearances become. There is a huge difference in pull between 0.030” and 0.090” gaps. Don't forget to consider any clearance in the rotor shaft and bearings. Shoot for a tight slip fit between the bearing and shaft. If the rotor is Too large the rake of the ramp becomes too little, unless additional magnets are used. The design is a balance of diameter, number of magnets, strength and size of the magnets, ramp length arc spacing and thickness. The power developed is provided by the rake of the ramp in relation to the rotor magnet (rate of change over distance or time). If the ramp can pivot in either direction the rake can be altered, thus decreasing the rate of change and throttling down the output. The ramp pivoting is a mechanically operated mechanism, the gas pedal. If the rake of the ramp is reversed it acts as a brake. If the rake is neutral, the motor stops. We have a 2 pole rotor and the attraction is balanced to the repulsion. You can rotate the rotor by hand and feel very little or no cogging. You stick a ramp at one side of the attracting stator magnet. As the attracted rotor magnet comes under the influence of the ramp it accelerates. As it accelerates toward the stator magnet, it also gains inertia. 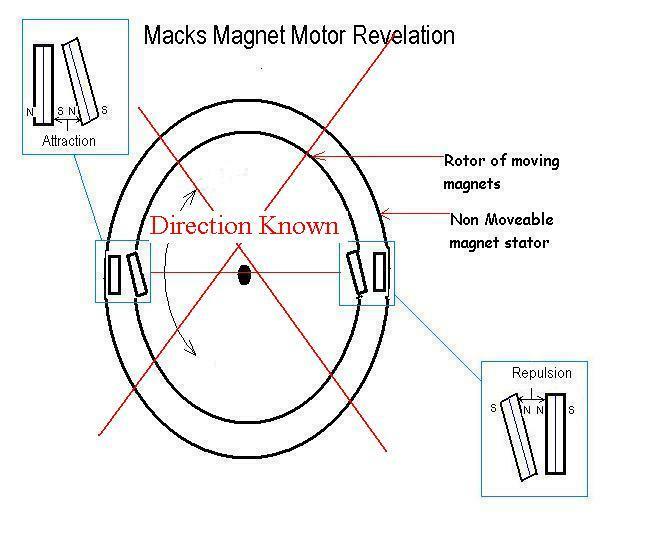 The stator magnet also attracts, but the stator magnets attraction is being neutralized by the repelling magnets at the opposite side of the motor. The rotor inertia carries the rotor magnet fully under and slightly past the attracting stator magnets center line. At this same instant, the rotor magnet at the opposite side, 180 degrees away has traveled slightly past the center line of the repelling stator magnet, which is now doing its job and preventing the attracted rotor magnet from being dragged back under its attracting stator magnet. The rotor is free wheeling at this point. Inertia continues the rotation until the rotor magnets come under the influence of the next set of ramps and the cycle repeats. You have to take magnetic induction in the ramps into account. Having a stator magnet touching at each end of the ramp turns the ramp into a bar magnet with strong NS poles, and interferes with things. We want the ramp close to or touching only one magnet at the end of the ramp like the Bedini drawing. The distance of this space varies with magnet strengths but a rule of thumb is a minimum of 1.5 to 2 times the gap between the rotor magnet and the ramp, at its widest point. In my 8 pole motor, with magnets every 45 degrees, the ramp length was about 30 degrees. Yours may be a little different.